← BOAT MUSIC — A JOURNEY TO WHERE? Fans of Andra Jackson‘s arts articles and interviews with visiting jazz musicians will welcome the chance to hear her perform on saxophone with the Moreland City Big Band, one of two big bands in which she plays. Fiery trumpet virtuoso Scott Tinkler, well known for his talent as a musician and heckler at gigs, is musical director and conducts the Moreland big band in this relaxed Sunday afternoon session as part of its Phoenix project. 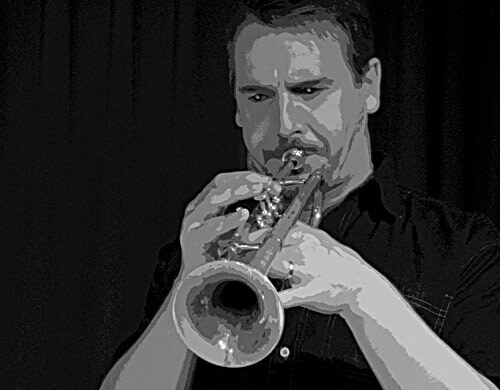 For a taste of what Tinkler can offer on trumpet, check out his new band tonight at Uptown Jazz Cafe, upstairs at 177 Brunswick St, Fitzroy, from 9pm to 11pm (September 29), with Marc Hannaford on piano, Sam Pankhurst on bass and Harry Shaw-Reynolds on drums (Tickets $15/10). Beginning as a traditional brass band in 1882, Moreland City Band in recent years has evolved into a hip, funky, multicultural ensemble that reflects the vibe of the local community. The ensemble covers a range of musical styles including jazz and big band idioms, Balkan and other world music, baroque music and traditional brass band arrangements. The line-up includes trumpets, horns, trombones, saxophones, double bass and drum kit. Band members include professional musicians, tertiary music students, music graduates and dedicated amateurs. Andra, a member of the jazz-imbued Jackson clan, which includes the Melbourne Jazz Co-operative‘s Martin Jackson and brother Adrian, who is artistic director for the Wangaratta and Stonnington jazz festivals, says the Moreland band features some “all stops out” soloists and some great composers. Admission is free, drinks are at bar prices and there is a raffle for bottles of wine and cajun kitchen. Moreland City Band rehearses on Wednesdays at 7:30pm at 21 Phoenix St Brunswick. New members and visitors are welcome and the band is particularly in need of lower brass. Moreland City Band has musical instruments available for loan free of charge to members and learners who attend rehearsals regularly. Players include Elise Winterflood double bass, Adrian Shaw trumpet, Cameron Lobb trombone, Sheldon King guitar and composition, Dushan Mitrovic clarinet/saxophone/trumpet, Catherine Connor trombone/piano, Radha Claridge saxophone, Ben Braithwaite drums, Jack Morris trombone and Brad Webb trumpet. The Intermediate Band, which rehearses on Wednesdays at 6:30pm, is conducted by university qualified music teacher Natasha Roberts. Children older than eight are welcome as well as adult learners. Again, the band can provide free instrument hire, provided the child or adult learner attends rehearsals regularly. University qualified music teachers can give instrumental lessons for $10 for a half hour. For further information visit the Moreland City Band website. This entry was posted in GIGS and tagged Adrian Jackson, Andra Jackson, Martin Jackson, Moreland City Big Band, Phoenix Project, scott tinkler, Stonnington Jazz, Wangaratta Festival of Jazz. Bookmark the permalink. Hi I am an adult learner keen to join the band. I would like to join the intermediate band and if possible , later on, join the professional band. I am a trumpet player and I would be very interested to take lessons too to improve faster. I would also like to help to raise money for the band. Does the intermediate band meet at Phenix street Brunswick?